This is the final installment of a three-part crib skirt tutorial. It’s not that the project was difficult, requiring three whole parts, but I was lazy and didn’t want to write it all up for one day. 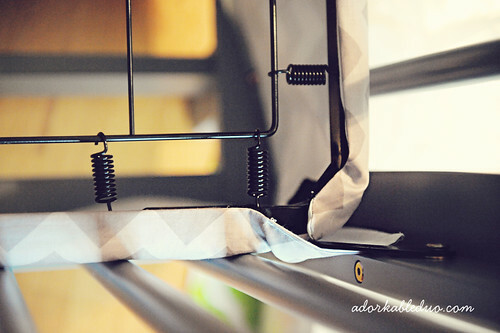 See how I placed the sticky Velcro to match up or align with the sewn Velcro on the panel? 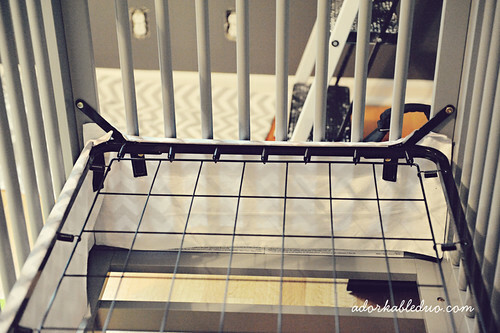 With the sticky Velcro in place, adhere the fabric panel to the crib frame. This was repeated for the remaining 9 Velcro sections. Velcro all of those sides on and you have just made an inexpensive crib skirt that isn’t a full crib skirt. 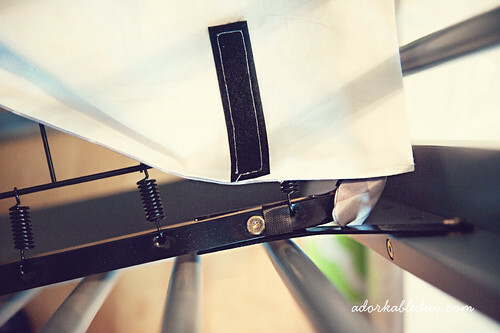 No one can even tell the difference and it’s height-adjustable as you lower your crib mattress for your growing baby – you just re-velcro the skirt to fit. To protect our dual-sided mattress, we placed a piece of cardboard on top of the springs, underneath the mattress. 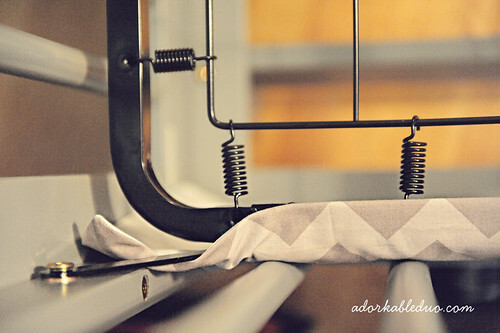 I figured this step would ensure that the mattress doesn’t get damaged since our skirt doesn’t have fabric covering the springs like sold skirts do. Awesome and detailed post. I knew in my mind how to go about an adjustable skirt using Velcro, but it’s very helpful to find a tutorial with measurements and steps laid out. It will make my project go more smoothly. Your pictures are a great help! Thanks! This bedding is super cute. You’ve inspired me to make my own for twins! 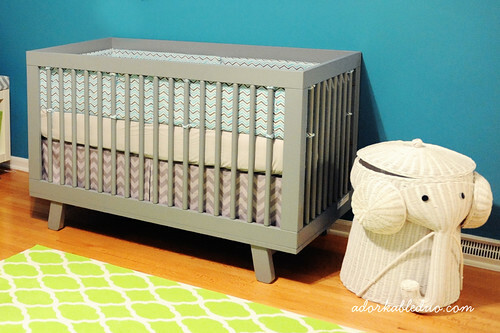 I couldn’t find a tutorial to your crib bumper but my main question is if you remember what size piping you used. I’m having the hardest time debating between 1/2″ thick piping and the size just smaller than that. I’m thinking yours looks like 1/2″. I was worried it would be too big. But whatever size you used I’m in love with it. Do you recall?? And did you use the bumper pad inserts that they sell at hobby lobby? The 6 foam inserts? I really like how you’ve stitched the bumper pad into 3 sections for that long side.